Whether it argues the perils of over-population (Hardin 1968) or of scarcity more generally (Ophuls 1977; Ophuls and Boyan 1992) the thrust of ecoauthoritarianism appears to remain the same. There are ecological imperatives which have to be addressed and the political organisation necessary to resolve them may not be particularly democratic. Primarily, this disorientation towards democracy is a function of two things; first, a strongly Hobbesian conception of human nature which implies that individuals will not, of their own free will, make selfless, co-operative personal choices; and second, an apparently overwhelming orientation towards ends-based policies, structures and institutions, rather than means-based ones. In other words, ecoauthoritarians take a very consequentialist moral line in which stark and mutually exclusive choices exist based upon either avoiding the ecological crisis through authoritarian measures, or suffering it. In Hardin's case he argues for 'mutual coercion mutually agreed upon' (1968); in Ophuls' case he argues for some kind of competent aristocracy to distribute scarce resources. Yet, a generous interpretation of Ophuls' model of scarcity politics would lead us to conclude that although he sees democracy as constrained at higher levels—perhaps national or regional—he is very keen on democracy lower down because he sees that type of freedom (at the micro-level) as differentiating his eco-society from other authoritarian regimes. Although this does not rescue the theory as a whole it should sensitise us to the fact that different types of democracy can exist at different levels. Democracy, as everyone knows, is susceptible to abuse and has all kinds of problems, but I know of no other mechanism for making policy decisions that has this ethical underpinning (citizens having the opportunity to present their views to legislators). The counter-argument to this given by Saward (directed against the ecoradicals, 1993) is that even if democracy is desirable (whether for intrinsic or instrumental reasons) it is simply incompatible with other green goals. Although I cannot resolve this question fully now, this point depends entirely on what these goals are. If green political theory is goal or ends oriented (as the ecoauthoritarians are) then this argument has some validity although it will depend on the extent to which we accept that democracy can exist within ecological constraints. However, it is not only possible, but also perfectly reasonable, to argue that green political theory should be more process oriented, in which case democracy becomes not only compatible with, but also essential to, green political theory. Without labouring the critique, let me just make one more point, the full importance of which will also become more evident as we go on. For ecoauthoritarians the ecological crisis presents us with the need to manage the finite resources of the planet effectively to trust in political or technocratic decisions that will, presumably, secure and distribute goods and control the ecological effects of their consumption. I would argue, however, that our ability to manage on the scale envisaged by ecoauthoritarians must be limited. In this respect then, it may be better to ensure that whatever solution we find to the ecological crisis (and to the centrality of democracy to green political theory), it had better be a process-oriented one, that is, one which minimises the need for management on the basis of inadequate information. Ecoradicals, on the other hand, are a much messier proposition. My central point will simply be that ecoradicals (if we take ecoradicals to belong in part to green parties and radical green movements) could afford to be more concerned with political processes (as opposed to political ends) and this in turn would help to resolve problems of green democracy. I will not be able to resolve these arguments, however, until later on. Goodin (1992) suggests that while there is a great deal of policy prescription within green programmes (as you would expect) there is actually very little on institutional change and on political processes. He notes that 'it is ecological values that form the focus of the green programme' (1992:183) and in this respect, green politics and political theory posits a largely holistic view of both problems and their solutions. In this, Goodin suggests that it is the non-discriminatory nature of green values and their push for diversity which lead them 'positively [to] embrace pluralism' (1992:199) and 'cherish diversity in its social every bit as much as in its biological form' (1992:199). There is, apparently, some gap between principles (values) on the one hand and policies on the other because there does not seem to be much on the question of policy or political processes to join the two, even at a theoretical level. In the economic programme there is an onus on individuals to act, as Goodin notices (and as rallying calls like 'think globally, act locally' imply), and for policy and lifestyle to become one and the same thing in places. In economic relations, as in politics, the green message appears to be the same and appears, still, to imply the type of political (democratic) relations necessary for individuals to take control. Dobson (1990, 1993) sees decentralisation as the central green prescription and sees the guiding principles of ecologism as subsumed under the broad headings of limits to growth (which implies interdependence, finite resources, the paucity of technological solutions) and ecologism's commitment to non-anthropocentric principles and policies. As far as the principle goes, Dobson, quite rightly, says that: 'much of ecologism's momentum is controversially engaged in widening the community of rights holders to animals, trees, plants and even inanimate nature' (1993:223). This provides us with our first tentative link between democracy on the one hand and philosophy on the other. Ecoradicals, at a philosophical level, though, fall into a variety of camps. Eckersley, for example, distinguishes three varieties of ecocentrism—autopoietic intrinsic value; transpersonal (deep) ecology; and ecofeminist (1992:60-74). Liberal political theory cannot commit a democracy beforehand to adopt any general rule or principle that answers the moral questions that confront it; if political theory could do this, it would become autocratic and inconsistent with democracy. It has been suggested that ecologism's commitment to principles such as liberty and democracy is compromised by apparently laying such great emphasis on the ends rather than the means of political association. I will be arguing that both of these points are correct, and that they are related. In other words, philosophically, greens have been concerned to expand the community of rights holders (or something similar) and they have also been concerned with ends rather than means. A commitment to some form of liberalism may help in counteracting some forms of strongly prescriptive ideology but it is likely that democracy will suffer unless other safeguards are built in. Of all the difficulties with the ecoradical's view of democracy, that is by far the most difficult to surmount. Yet in a broader philosophical sense, ecoradicals are far from as consequentialist as their programmes suggest; they lean quite strongly towards doing what is 'right', as much as they do towards what is ultimately 'good'. Certainly in terms of their views on the political system, we can see fairly clearly that their support for participatory democracy and decentralisation denotes a view of how people can develop, grow and take control which is independent of what outcomes that might entail. 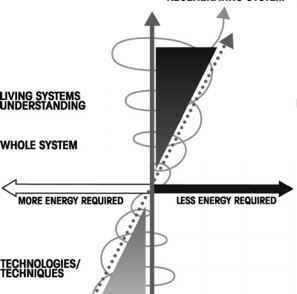 Ecoauthoritarians and ecoradicals do display some of the same problems, but in different degrees. Primarily, we can see that both do not necessarily protect (or even advance) a position on democracy which is defensible against strongly asserted and pressing political, economic and social goals. While in the case of ecoauthoritarians I would argue that they are perhaps a little more democratic than we sometimes give them credit for, nevertheless, there is little room theoretically for a consistent commitment to democracy. Ecoradicals, on the other hand, do emphasise democracy but fail to reconcile it with broader imperatives. Such a reconciliation is possible if we change the emphasis of their thinking away from goals and direct it more towards political mechanisms. Both approaches, to my mind at least, have not taken on board the consequences of their very starting point sufficiently. Before all else, for both, comes the assertion that the ecological crisis is primarily a crisis of our ethical system. Although we may perceive our current problems as those of over-population, resource depletion, and food scarcity, these are first and foremost symptoms of an ethical crisis. Environmental philosophers have been criticised for not providing the types of guidelines to political action which political theorists prefer (see, for example, Dobson 1989) but it has to be said that there is plenty to be getting on with if an ethically based green political theory is what theorists are after.